Featuring stories by Howard Frank Mosher, Annie Proulx, Wallace Stegner, Megan Mayhew Bergman, Castle Freeman, Jr., Peter Gould, Ellen Lesser, Jeffrey Lent, Miciah Bay Gault, Bill Schubart, Robin MacArthur, Laurie Alberts, Julia Alvarez, Joseph Bruchac, Suzanne Kingsbury and others, this book is a chorus of voices portraying the diversified landscape and culture of Vermont. 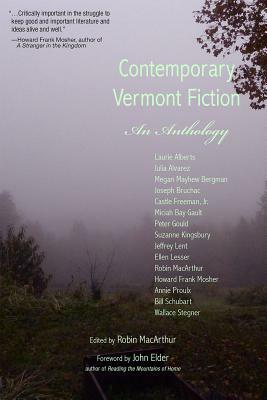 Though we believe such a book will be particularly relevant to Vermont residents and tourists, Green Writers Press has national distribution and we hope the anthology will have broad reach and impact. We consider this collection not just an ode to a specific place, but a book about how places shape and are shaped by the people who inhabit them, how writers interpret places differently, and about the power of fiction itself: how stories are a means of engendering empathy, illuminating interconnection, prompting new ways of imagining and living, and by doing all of these, help birth cultures of conservation. Wallace Stegner wrote, No place is a place until things that have happened in it are rememberedfictions serve as well as facts. We at Green Writers Press agree and believe such literary renderings are key components to the conservation, understanding, appreciation and preservation of places. John Elder specializes in American nature writing and pastoral literature, as well as Basho and the Haiku Tradition, contemporary poetry and environmental studies. He has received a National Endowment for the Humanities Fellowship, a Fulbright Senior Research Fellowship and Guggenheim Fellowship. His most recent books include Reading the Mountains of Home (Harvard University Press, 1998), The Frog Run (Milkweed Editions, 2002).Editor, Robin MacArthur, is a third-generation Vermonter from Marlboro who has been studying Vermont-based fiction (and writing her own) since she left for college at eighteen. She has an MFA in Fiction from Vermont College of Fine Arts; her essays and stories about Vermont have appeared in Orion, Shenandoah, Hunger Mountain and Alaska Quarterly.